With views of the Manhattan skyline and New York Harbor from the kitchen and living room, Residence 3B spans 1,854 square feet, offering 3 bedrooms and two and a half bathrooms with each detail thoughtfully considered by Santa Monica-based, AD100 interior design firm Marmol Radziner. Occupancy Summer 2019. Combining the elegance of natural materials with the warm, inviting aesthetics of California modernism, the corner living and dining space boasts 8" wide-plank oak flooring, 9'2" ceilings, and floor-to-ceiling windows with majestic water and city views. The living room unfolds to the custom Marmol Radziner-designed vented, windowed kitchen, generously outfitted with a fully integrated Gaggenau appliance package including 30" speed oven and 30" warming drawer, as well as white oak cabinetry, leathered-finished White Princess Quartzite countertops, backsplash and hood surround, and custom smoked bronze hardware. Tucked privately away from the entertaining spaces and secondary bedrooms, a stunning master suite offers serene Northern views, a formal dressing area with generously-sized closets and a five-piece en-suite master bathroom with imported Italian Alabastrino Rustico Travertine slab marble and radiant heated floors. A freestanding soaking tub, oversized shower, and brushed oak vanity with integrated double sinks and specialty under-vanity lighting complete this retreat. 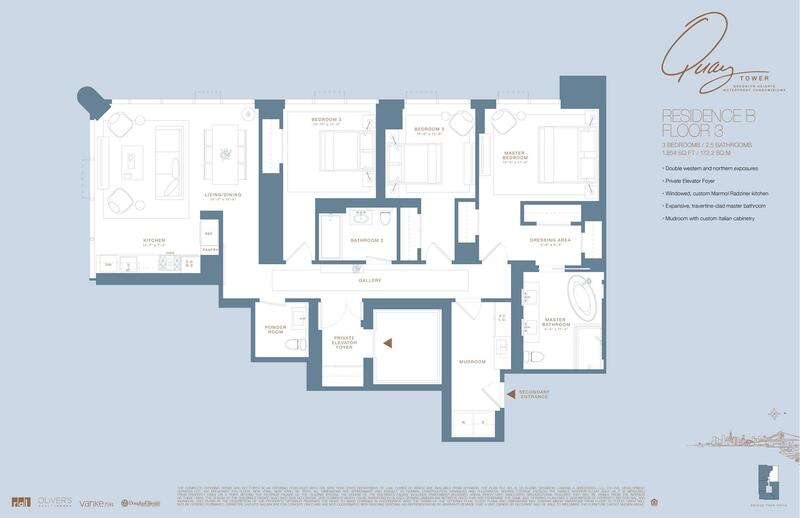 The residence offers private elevator entry and a separate mudroom entrance, a rarity in the Brooklyn marketplace. The remaining two bedrooms are north-facing and generously proportioned with ample closet space. Down an elegant gallery, a full bathroom and secondary entrance opens to a private mudroom replete with Italian cabinetry for storage, cork wall and full-sized Whirlpool washer and vented dryer. Additional appointments include pre-wiring for shade control, an integrated Amazon Echo for a customizable smart home experience and zoned heating and air conditioning. THE COMPLETE OFFERING TERMS ARE IN AN OFFERING PLAN AVAILABLE FROM SPONSOR. AG FILE NO. CD18-0035. Sponsor: LANDING A ASSOCIATES, LLC Sponsor Address: 494 Broadway #5 New York, NY 10013.